Delicious Simple Recipes & Daily Steps to help you feel Vibrant, Healthy & In Shape. Make Lasting Changes in your Diet once and for all through Tried-&-Tested Simple Steps. Remove your Cravings and desires for the “Wrong foods” with total enjoyment! Learn Fast Recipes for the Whole Day: Breakfast, Lunch, Dinner and Deletable Desserts. 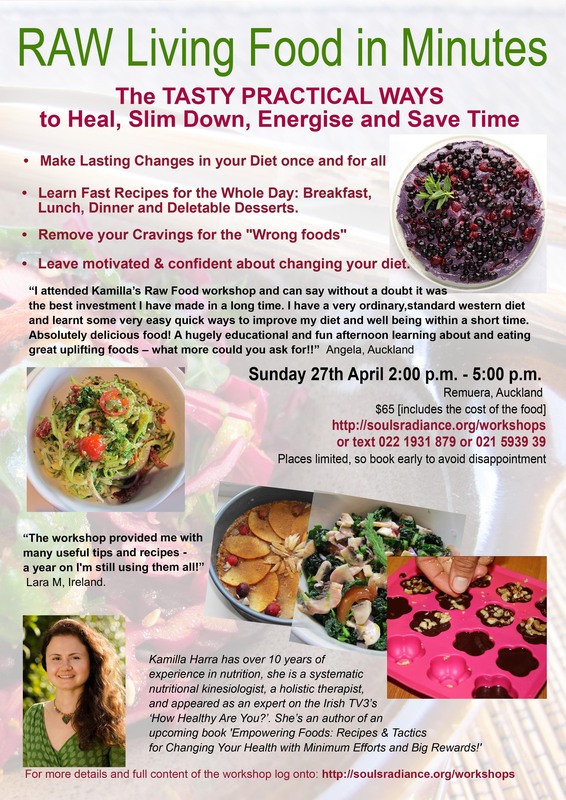 Included in the Workshop: All the Delicious Food prepared on the Day goes straight into your tummy :), Informational RAW Booklet, The Recipes Booklet, Heaps of Tips and Practical ideas on how to increase the raw content in your diet, what to implement at different stages in the most effective way for you.